So this has been on my blogging list to do for some time and I should get it out. Sitting on my office table is a yummy orange product that I use for my eyes. It doubles as an eye massager and an eye brightener. I used it when my eyes are feeling so tired from staring at the screen all day long. It helps to hydrate and refresh my eyes when I need it. The ball roller, it pops out and you can dispense the white cream liquid and roll around the eye area to de-puff your eyes. I really like the color and how easy it is to just use it for a quick fix. The only thing that I'd say is, the roller ball is plastic. I wish it was metal so it's smoother to roll on the eyes and cooling too. That's what so cool about Clinique's Pep-Start series which is designed for the millennials to prep, pep and out the door! No time to lose. There are only three products so far from this colorful range. The first is the quick fix for eyes, Pep-Start Eye Cream, Pep-Start HydroBlur Moisturiser, and the Pep-Start 2-in-1 Exfoliating Cleanser. I'll break it down to you in this post what each product doubles up for alright? A pep rush for eyes. Just 3 seconds to look wide awake, refreshed. Hydrates, brightens, perks you up. Its cool touch and de-puffing tip help keep eyes looking fresh. Smooths the way for makeup, too. Have it on hand. Ophthalmologist Tested. This product is allergy and ophthalmologist tested, and free of oil and fragrance. No Parabens. 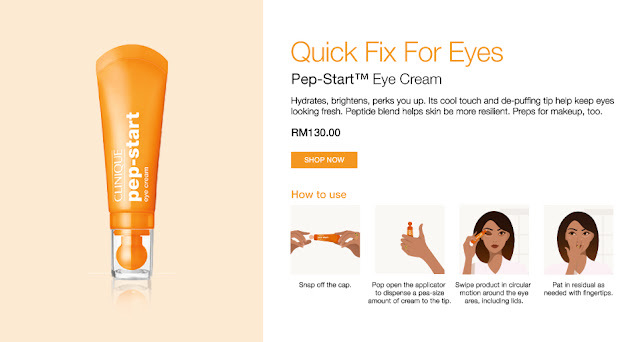 P.S: If you're looking for an eye cream, I'll recommend the Pep-Start Eye Cream! Mine is almost done and I'll repurchase it because it has worked for me so far. Easy to use, easy to keep, easy to bring for travel. 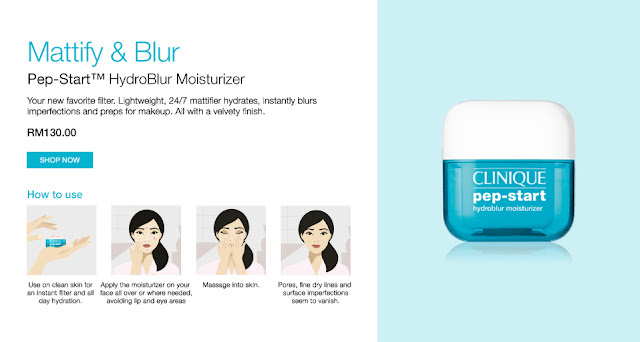 This oil-free moisturizer instantly blurs imperfections while providing all-day hydration. Skin looks naturally perfected with a matte finish. Wear it alone, or under foundation. It's so lightweight you can use it for touch-ups throughout the day. We call it your new favorite filter...the ideal way to give your skin the moisture it needs, and the forgiving 'retouch' that blurs the look of pores and fine dry lines. This product is allergy tested, non-acnegenic, and free of fragrance and oil. No Parabens. P.S: If you have pores, then you'll want to try this product out. It doubles as a primer and a moisturizer. A beauty filter in a tub. By combining gentle cleansing with exfoliating power, this 2-in-1 formula takes away dirt, dulling dead skin cells, excess oil and impurities to give skin a smooth finish and a radiant glow. Preps skin for makeup. It is gentle enough to use twice a day. Exfoliation is achieved through the natural enzymatic action of papaya extract and the manual action of natural silica and bamboo beads. The base provides a cooling cushion and foams into a satisfying lather. No Parabens No Phthalates. P.S: Hate keeping two products, one for scrubbing, one for cleansing? Then this 2-in-1 scrub cleanser will come in handy! Especially when you are on the road. This exactly new to the beauty sphere but better late than never for Clinique. 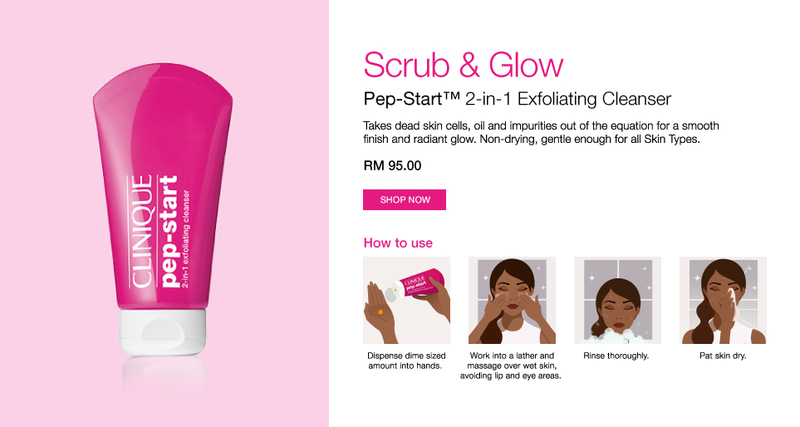 Pep-Starters are available on Clinique Malaysia online, Sephora Malaysia and at Clinique counters. Clinique official has shown new products in the Pep-Start line, the addition of Pep-Start™ Quick Cleansing Swipes (cleanse and go), Clinique Pep-Start™ HydroRush Moisturizer Broad Spectrum SPF 20 (moisturize and protect), and Clinique Pep-Start™ Daily UV Protector Broad Spectrum SPF 50 (perfect and protect). u bought 5?! wow that's alot.. u worst than me at hoarding things haha! Once i finish mine I check with you if you're still letting go. Eh how come the exp so fast? they not launch last year?